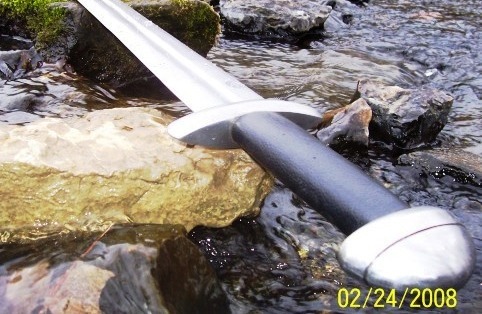 In this review by die hard Darksword Armory fan Jason Woodard (the gentleman who originally introduced me to this line)  we take a look at the straight bladed version, both from the perspective of how it looks and handles - as well as some heavy testing to ensure it is as durable as the rest of their hand forged blades. This version of DSAs Saxon is made with a leather wrapped handle and a scabbard made of wood, wrapped in matching black leather . While it is quite a heavy sword, the Balance point which is about 4 and ¾ down the blade makes it seem lighter than you would think. 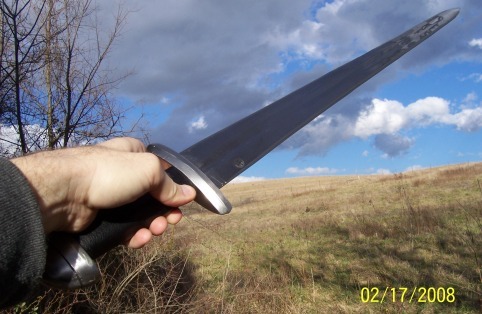 The Physical properties of the blade are, like all Darksword Armory swords; SAE 1060 high carbon steel, tempered and normalized to a Rockwell Hardness of 53. 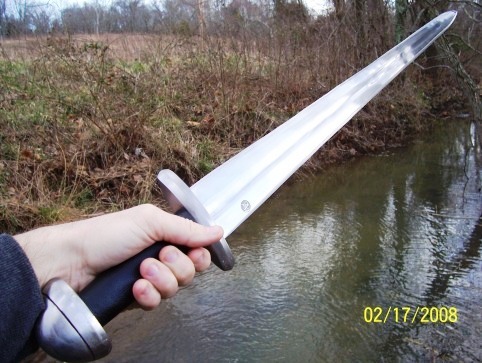 This Saxon sword from DSA is their newest model.. I`ve really been looking forward to testing it.. One reason this is my first Saxon style sword the other is this will be my first one I have sharpened myself. After getting the sword from the good old UPS man and unpacking I gave it a good polish and took off the heavy oil protecting it from rust.. I went outside to get a feel for this Saxon.. I swung it a bit, Did some air thrusts and chopping moves..
I`ve got to say, I really like the way it flows. Good balance, good recovery and it just feels right in the hand. I had heard that this design of grip can be a bit uncomfortable and tight. 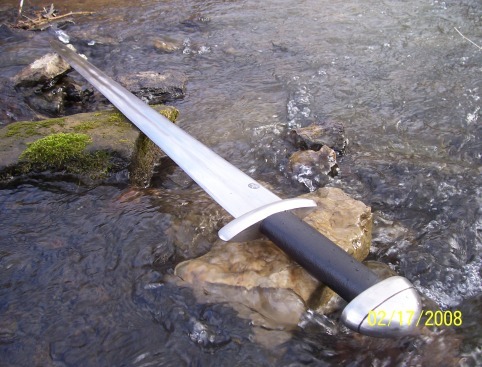 But I didnt find that at all, in fact I really like it  so much so that this might just be my new favorite sword!! The Old gentleman that used to sharpen my swords has retired, so I thought Id try it myself this time. After reading Paul's review of DSA`s Medieval Knight model 1306, I ordered one of those accusharps, put the Saxon In a vice and after about 20 min`s each side it was ready for testing.. I have to say you will feel a certain pride knowing you have sharpened your own sword.. It took a little elbow grease but it was very satisfying.. I had to wait for the weather to get a little better but I got a break and got out and did some testing on the Saxon... I started with cutting a some large jugs filled with water. As you can see, it cut through just fine and I felt no resistance. Upping the ante, I was able to cut threw five gallon water bottles with one swing, no problem at all! Next up was the five gallon water made from tough impact resistance plastic this was the piercing test..The Saxon went in deep, the blade does get wider down the blade so it did slow a bit and I did not have a great stool that was stable enough for this test..
Now I gave it the old heavy cutting test. I put a lot of power into the swings to try and chop the bottle down.. 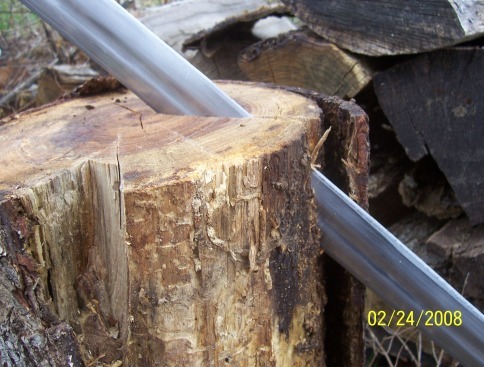 The Saxon held up well and cut pretty deep..
My last test was on a seasoned hickory stump.. I gave it four good heavy cuts.The Saxon sank deep into the wood almost three inches.. The fittings all stayed tight, nothing came loose. 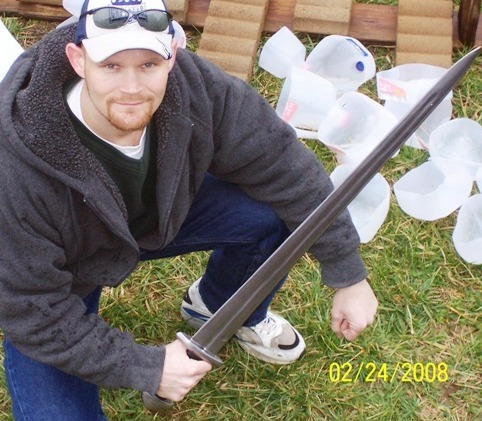 The blade only had some small cosmetic scratch marks from the big jug and the stump that were easily buffed out  but no damage. This is a very nice sword. My fave right now.. Its tough and handles well  and truly a great deal for a handmade fully battle really sword!!! Yup, another winner from Darksword-Armory! Definitely the best buy for the toughest Saxon on the market.. Thanks once again for your time.